Enjoy a night with family and friends without sacrificing comfort. The A8L promotes relaxation and comfort with its spacious design, bent-knee lounger, and theraputic captain's chairs. This luxurious spa comes equipped wiht 6 customized JetPaks to elevate the hyrotheraputic experience. Reveal in a night of relaxation with this compact spa that doesn't sacrafice comfort. Great for singles, urbanites, couples, and small families, the A6L accomdates up to 6 people pleasantly. Sit back and enjoy the soothing JetPaks for a personalize hydromassage experience and let your stress melt away. You'll be able to relax your way in the R8L. With a premium bent-knee lounge seat and 4 personalized JetPaks, the variety of seating and features make this spa experience at a cost you can afford. Both compact and therapeutic, the X6L is the right hot tub for saving space without sacrificing first-rate hydrotherapy. The X6L features a therapeutic lounge seat, corner captain seates, and more. Enjoy a quiet, intimate night with your spouse or enjoy a relaxing evening with family or a few friends. At our very core Bullfrog Spas are all about making your spa your own. Bullfrog Spas offers a variety of exclusive options and accessories to compliment and beautify your hot tub. Most of these hot tub accessories are shown here but these are just a few of the options available to enhance your new Bullfrog Spa. 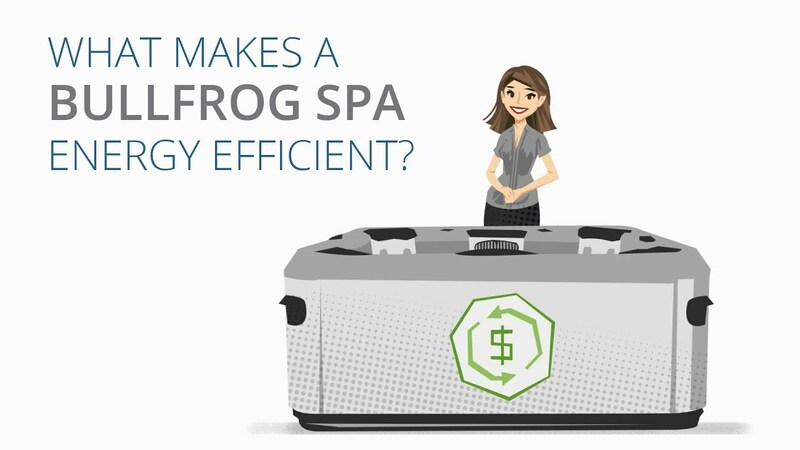 If you would like to view a more comprehensive collection of accessories and learn more about how you can perfectly customize your Bullfrog Spa. Bullfrog Spas are focused on allowing you to create your perfect personal spa experience. This doesn't just apply to our JetPak Therapy System. You will also be able to choose from a full range of beautiful color choices to suit your landscape, home, and personal tastes. Choose the spa shell color you like and make your hot tub the perfect expression of your style. EternaWood™ is both weather and UV-resistant, assuring that it will be maintenance free service for years to come. No staining required! Bullfrog Spas offers 3 stylish EternaWood™ hot tub cabinet colors. Ivory is a new color only available on premium cabinets. The contemporary slat design and rich off-white tone provides the traditional look of painted wood with the modern flat aesthetic that is so popular in home design today. Ivory looks great with nearly every shell color but is especially attractive in combination with Sapphire, Titanium, Snow and Platinum. Slate is a new color only available on premium cabinets. The flat contemporary slat design is an aesthetic that is very popular in home design today. Slate’s neutral cool grey tone is a perfect way to create a spa look that is clean, fresh and new. Slate pairs especially well with Snow, Sapphire, Platinum and Midnight. *Premium cabinets only available on A Series spas or standard on STIL. Hazelnut is a rich and warm natural medium wood tone that looks especially great with Pearl, Mirage, and Midnight Canyon spa shells. Driftwood is reminiscent of your favorite seaside vacation. It pairs well with all spa shell colors and looks especially stunning with Snow, Midnight Canyon, and Platinum. Mahogany provides a rich deep red wood tone for a luxurious look. Mahogany pairs perfectly with all spa shell colors, especially Platinum and Mirage. Harbor Grey is a is a coastal inspired gray tone that looks especially great with Platinum X Series spas. All Bullfrog Spas come equipped with state-of-the-art computerized control systems. These systems are designed to make operation of your spa as simple and intuitive as possible. Our premium hot tub controls are also engineered to be durable and function for years without any problems in the environment around your hot tub. Bullfrog Spas give you the unique ability to control your hottub from anywhere with your own Android or iOS smart phone. There are several different options for remote spa operation, including control of heating and jet functions as well as certain spa security monitoring functions. Your phone is an integral part of your lifestyle, now you can use it to monitor and control your Bullfrog Spa too! Visit our CloudControl™ page for more information on this incredible hot tub app. Spa-side remote touch pads are available throughout the spa at locations just out of reach of the main control pad. This gives you a simple and convenient way to control the jets without leaving your seat. Relax in your favorite seat with jets on or off at your convenience. Bullfrog Spas' audio systems utilize premium components to produce rich sound that wraps around our premium seats and sounds incredible even at low volume levels. Enjoy personal relaxation without waking the neighbors, or turn it up for get togethers and parties. These marine-grade audio systems are compatible with bluetooth-enabled devices including smart phones and nearly all other digital music players. With this much control over your music you can choose exactly how relaxation sounds to you. The Elite Audio System includes seat surround speakers and a powered sub-woofer to immerse you with rich high-quality sound. Protect and charge your iPod, iPhone, or other digital music player right in the spa-side water-proof device housing. Or, simply connect via bluetooth and stream your favorite playlists. Bullfrog Spas' Life Audio System, available on A Series and R Series Spas, is a spa audio system that sounds great at a price everyone can afford. Play your favorite playlists, artists or songs directly from your iPod, iPhone, Android Phone, or MP3 player. This is the perfect in-spa audio system if you would like the option of occasionally listening to your favorite songs in the spa direct from your device. Nothing adds to the ambience of spa relaxation quite like a peaceful and relaxing waterfall. The soothing sounds of falling waters remind us of beautiful tropical cascades, transporting you in seconds to that tranquil place. Our A Series, R Series, STIL, and X Series spas each feature a unique integrated lighted waterfall with its own unique appeal. Our A Series, R Series and STIL spas each feature a premium interior lighting package with lighted water feature, filter area and center logo light to enhance your nighttime spa experience. A Series spas additionally feature lighted cup holders and surround lighting to set just the right mood. Powerful and energy efficient, these full-color LED lights are capable of producing virtually any color and they beautifully distribute light throughout the spa. You can choose from a variety of effects ranging from calm cool colors to enhance your relaxing and romantic spa experience, to a slowly fading in and out of each color, to a quickly changing multi-colored light show for hot tub parties. Exterior LED sconce lights are placed around the outside perimeter of your spa. These true daylight white LED lights create a safe, illuminated spa environment and make a beautiful addition to your backyard sanctuary that you will appreciate in the evening hours. Genuine Patio Performance™ hot tub covers come standard with all Bullfrog Spas. In addition to their high-end look, these long-lasting premium spa covers feature an advanced patio fabric, treated to be UV and fade resistant, as well as weather repellant, and they are up to 25% lighter than standard vinyl hot tub covers. Genuine Bullfrog Spas covers are also designed to provide maximum insulation for energy efficiency. The Patio Performance™ hot tub cover features locking clips for safely securing your spa when not in use and protecting it from opening as a result of wind or extreme weather. Bullfrog Spa covers come in two colors, Pewter (grey) and Espresso (brown). The simple design of Bullfrog's durable cover lifter provides true convenience and functionality. Lift the spa cover and enjoy relaxation in just a couple of seconds. This device creates wonderful privacy as well while you are relaxing in your Bullfrog Spa. Convenient DuraStep hot tub steps are color-matched to the spa cabinet and coordinated with the spa cover. These long-lasting steps create safe and easy access to your Bullfrog spa with a non-slip surface and durable composite construction. The WellSpring High-Output Ozone Purifier features Corona Discharge Electrode Technology that consistently helps to keep your spa clean and can significantly reduce the amount of sanitizing chemicals needed. Bullfrog Spas offers a dedicated and programmable filtration pump to improve water cleansing performance with virtually silent and vibration-free operation. This is the perfect option for spas installed at hotels, apartment or condo balconies, on decks, or on patios near windows. All jets on both A Series and STIL™ spas come standard with a stylish brushed stainless finish. Additionally, the low profile flush mount of these jets (unique to Bullfrog Spas) maintains the uninterrupted flow and and feel the spa as it was designed. No other spa on the market today offers such an elegant look. Your Bullfrog Spa is not only relaxing and comfortable, it will also turn heads with tasteful design elements you just can't get in traditional spas. Bullfrog Spas® proprietary JetPak® Therapy System uses the world’s finest hot tub jets to achieve a variety of unique hydromassage sensations in each seat. Each of our jets has been developed with the assistance of massage and wellness experts to meet a specific therapy objective. From our JetPaks to our in-spa wrist, foot, and leg jets, you’re assured a reliable, enjoyable, and therapeutic hydrotherapy experience. Add the world’s finest hot tub therapy jets to the customization offered by the patented JetPak Therapy System and Bullfrog’s cutting edge spa designs and you get the world’s best hot tub experience. The DeepRelief Jet powers away tension, muscle aches, and stress with an intense, deep-tissue massage with a focused deep penetrating pressure. The Firm Relief Jet provides a steady pressure that is favored for its “just right” feel and perfect blend of stress relief and relaxation. The Single Pulse Jet offers a slow and deliberate pulsing action in the medium to strong range to rhythmically loosen muscles and eliminate stress. The Dual Pulse Jet provides a medium pressure massage with 2 rapidly pulsating spinning jet nozzles for deep relaxation, escape, and stress relief. The Oscillator Jet is a Bullfrog spas exclusive that gives you a unique and deliberate kneading action that is both therapeutic and soothing. The RainShower Jet gives you a smooth and lightly relaxing massage unlike any other with its constant stream water-only jet action. Target Therapy Jets are placed throughout the spa at key tension areas. This jet focuses a firm pressure to relieve specific muscle groups. Mini Target Therapy Jets provide a steady stream of powerful targeted therapy for the wrists, hands, and forearms. The DualPulse Foot Therapy Jet provides a pulsing and relaxing massage for the soles of your feet dialed to just the right intensity.